In my post of April 26th, I showed you the foundation for a 24 x 24 inch oil - "Young at Heart." After being stuck there for a couple days, looking at it and trying to get a clear vision for the finished painting, I resorted to my usual method of working and made a small color study of the scene. 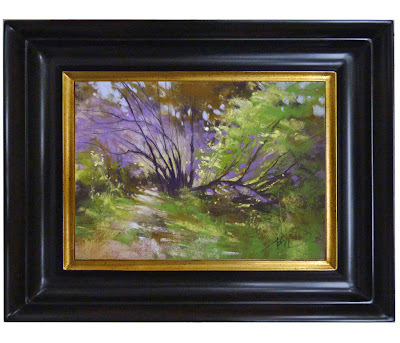 This one is in pastel, 5x7 inches and will be available on Daily Paintworks beginning May 3rd. 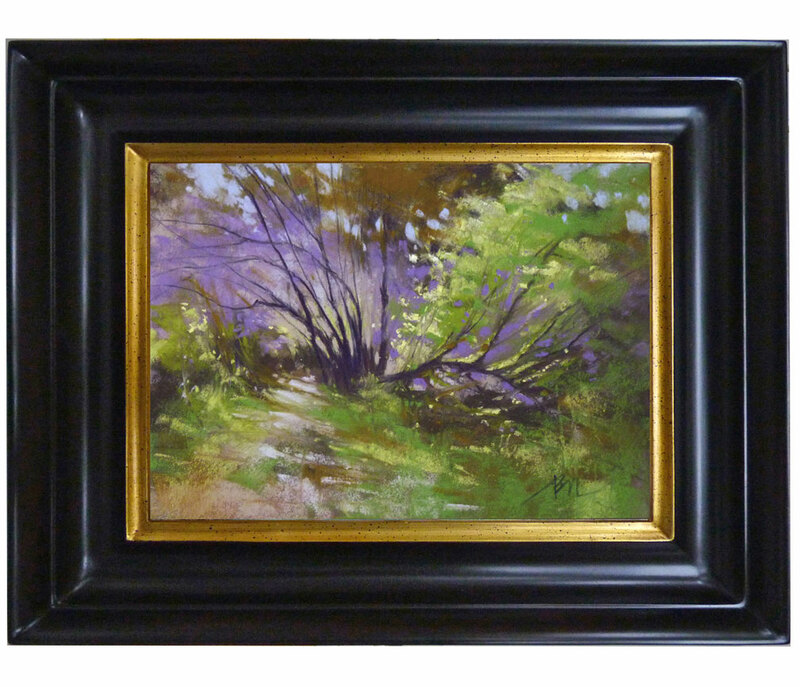 I delayed the start of the auction for a few days so I could paint the oil with the pastel color study beside me for reference of color, value, and most of all, a reminder to keep my paint strokes fresh and loose. 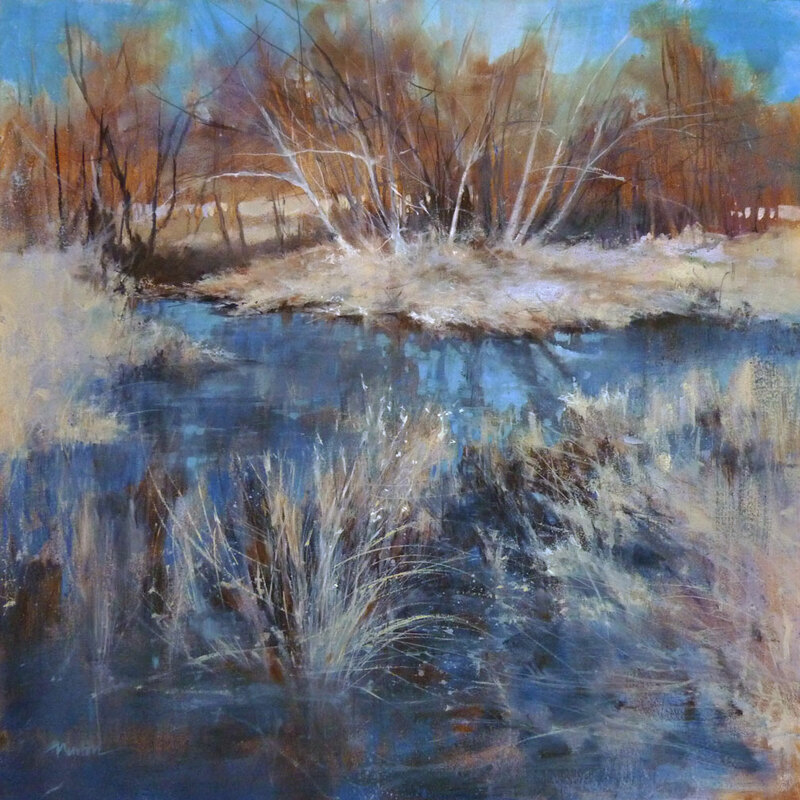 Suddenly it is the end of the month and time for another painting from my studio for the Studio Sale link. 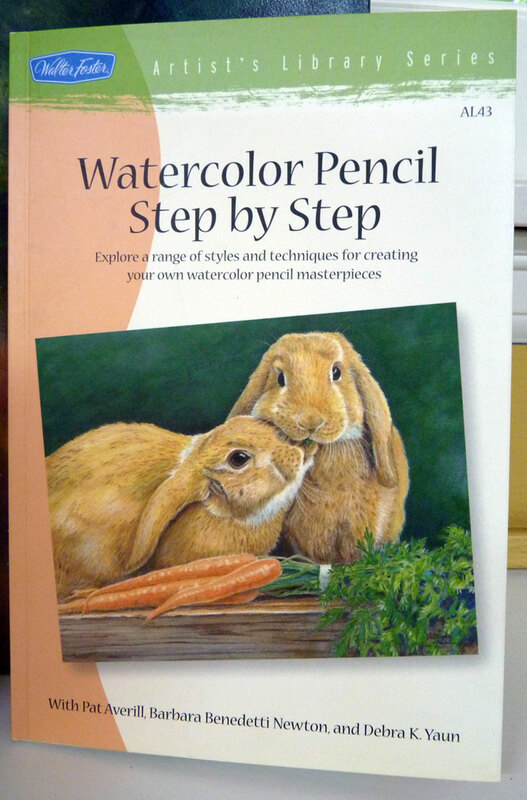 About 10 years ago, I co-authored a book on watercolor pencil for Walter Foster Artist's Library Series. These are great little books to introduce the novice to a new medium. 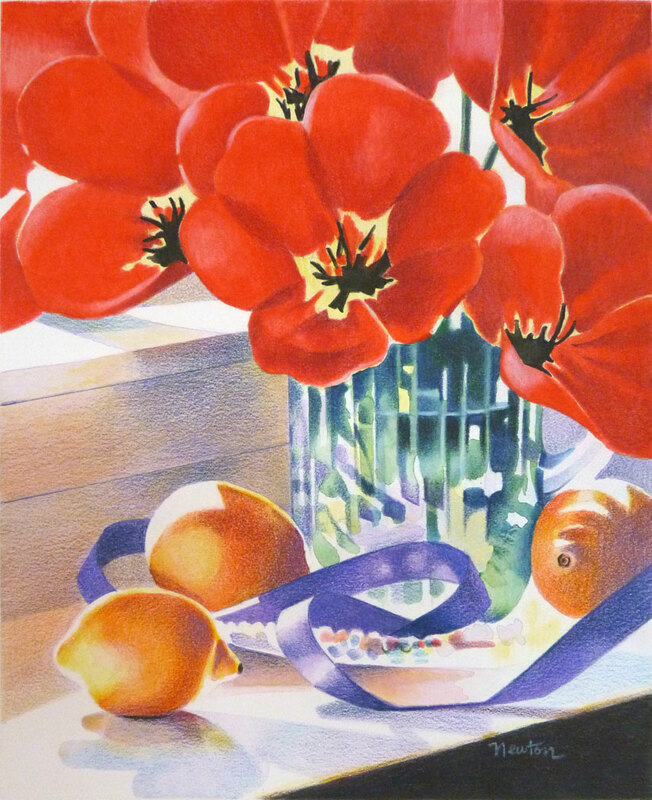 This month's Studio Sale offering is "Full Bloom #2," watercolor pencil, 11.25x9 inches. For purchase information go to the Studio Sales link in the sidebar. 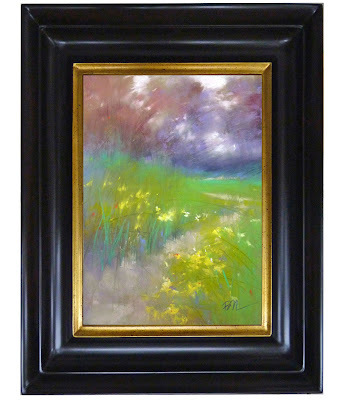 Tentatively titled "Young at Heart," this is the first oil (24x24 inches) from the Pt. Defiance Park reference photos. Above: the charcoal line drawing on white gessoed wood panel. Below: the first strokes for value and mass. 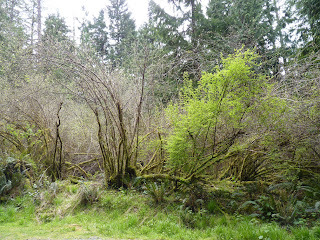 I went on a spring photo shoot yesterday at Point Defiance Park, Tacoma, WA. 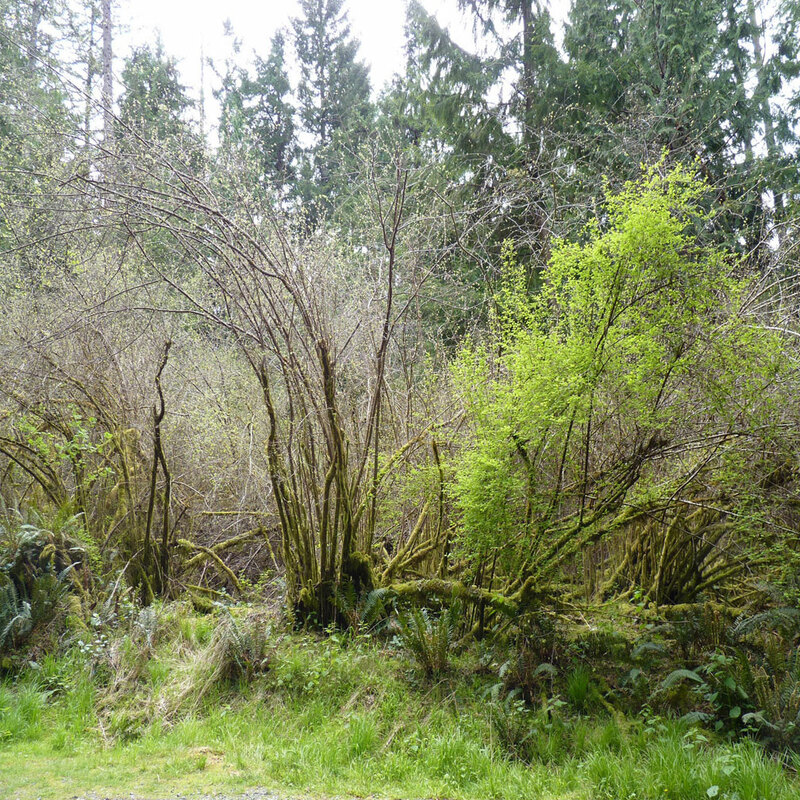 Lots of fresh yellow greens, end-of-winter hazy lavenders and lush green-gold moss! Above is one of the horizontal frame reference photos. I want to paint this scene in a square format so I distorted, then cropped, the photo in my computer to make it square. Next, I changed the mode to gray scale to better see the values for my foundation painting. Yeah spring! 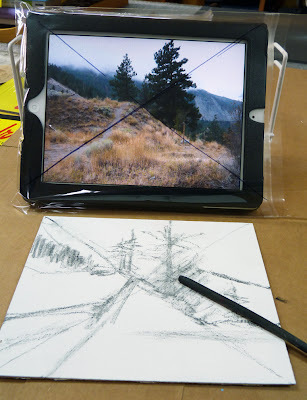 In an effort to cut down on the amount of paper in my life, today I'm using this method for transferring a reference photo image to my painting surface. 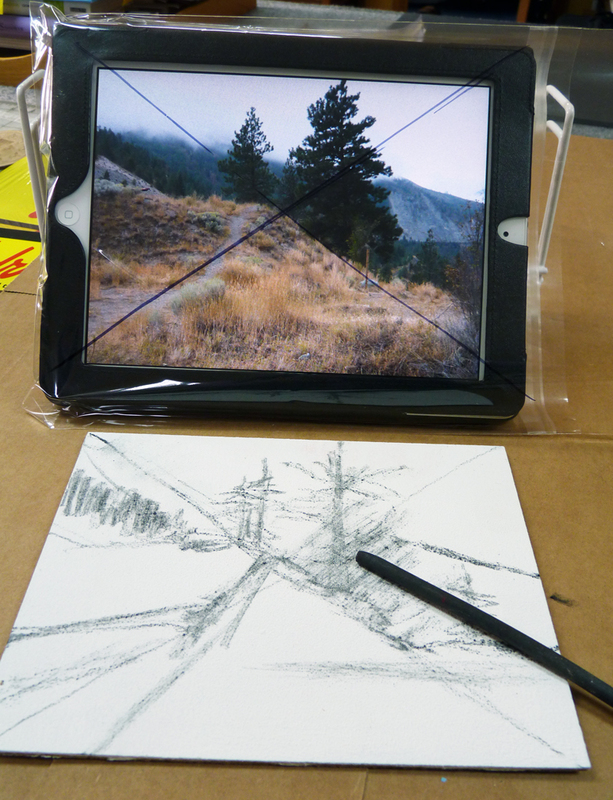 I drew an X on a clear poly envelope and slipped my iPad inside. 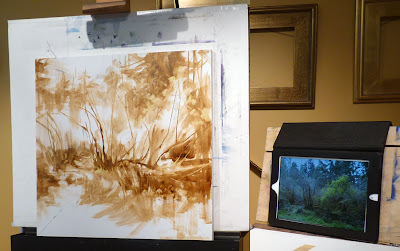 Using a charcoal stick, I transferred the scene to a gessoed painting surface. Yay! One piece of paper and printer ink saved because I didn't print the reference photo. I am done with winter. It is time to move away from the wintery Nisqually Wildlife Refuge reference photos and on to spring. 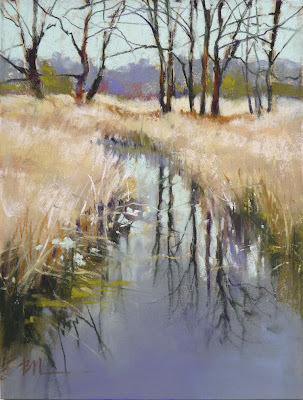 For this last oil painting of the Nisqually series, I applied a tonal foundation, then I referred to my color notes on my pastel painting, "Spring Light, Winter Shade." To see the foundation and first step of color of this painting, click here. 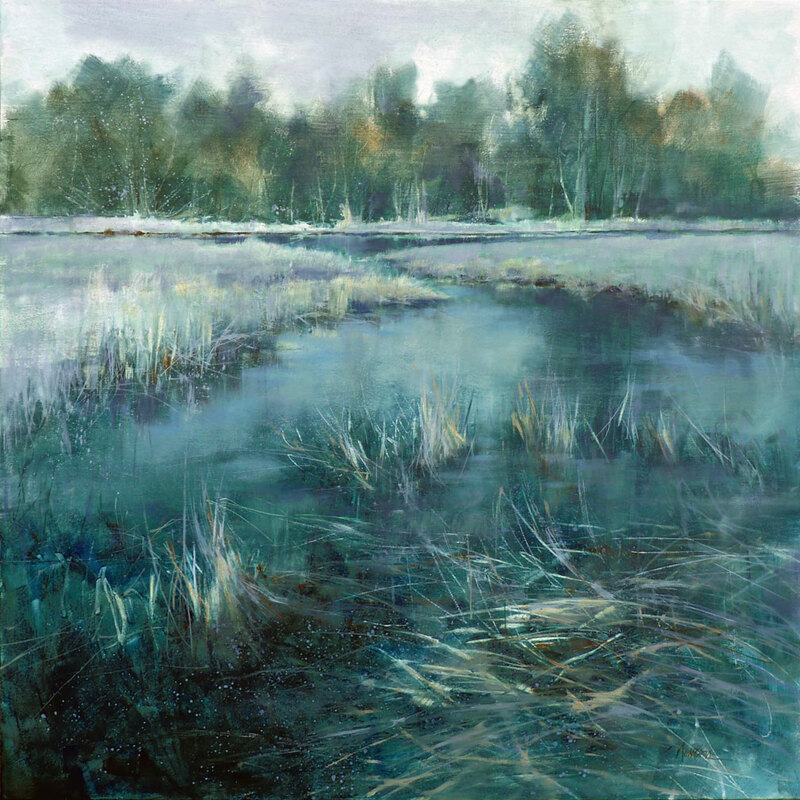 "From Now Until Then," 24x24 inches, oil on wood panel. 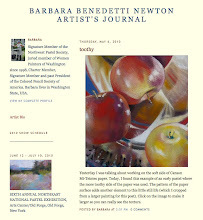 A lot has happened to the painting in my March 25th post. I answered some of the questions posted there and then asked and answered more. I also changed the name from the working title, Reverie, to "Until We Meet Again." 24x24 inches, oil on panel. Finally! Here is the news I've alluded to a couple times on my blog since last August. 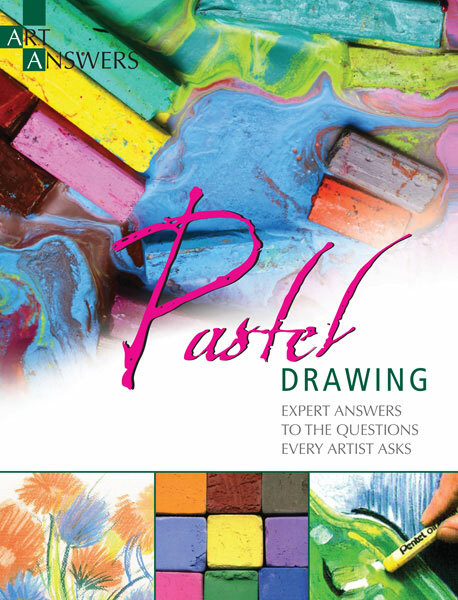 Art Answers: Pastels Drawing will be published in the UK and in the US in June. This is a book I compiled of 200 questions and answers. 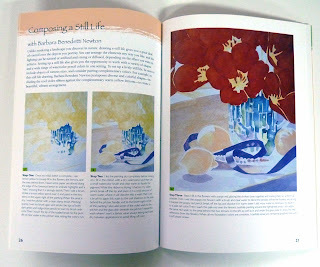 It features images of my pastel paintings, step by step demos and text. 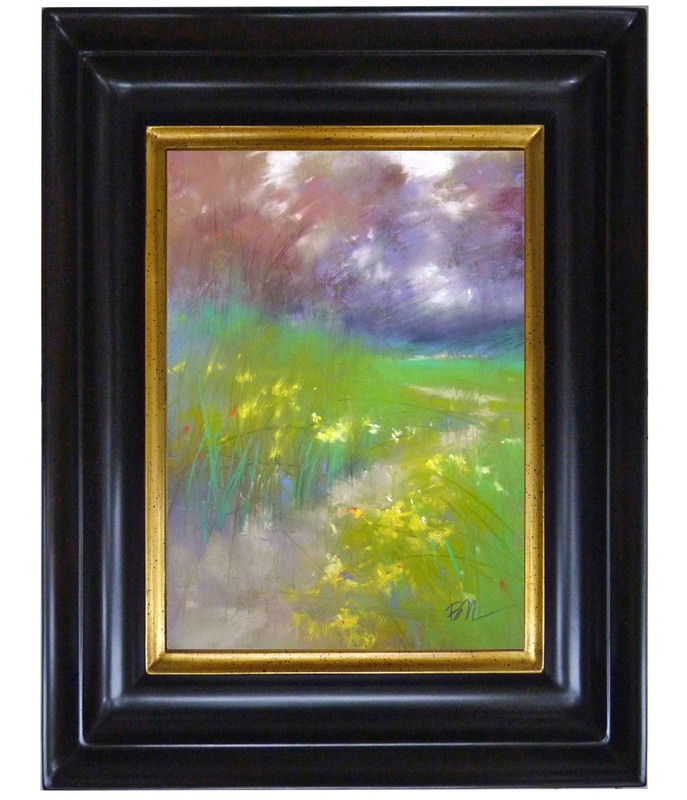 I have also included other pastel artists' work and words. What started out as a minor project turned into a major undertaking that I am proud of. I've seen the proof but look forward to holding the finished book in my hands. 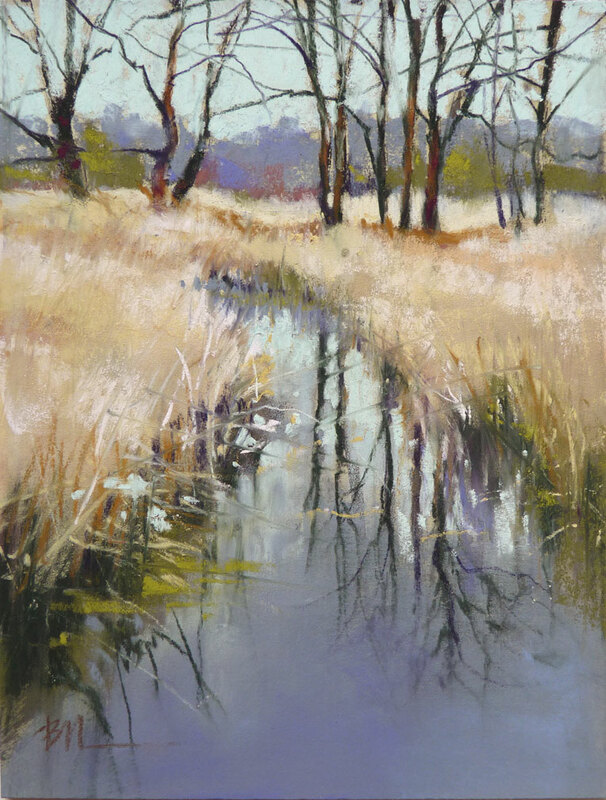 Also, my July 2013 pastel workshop, Landscape Impressions, is full with a waiting list. Thanks to all who responded. I hope to have this new book available at the workshop as well as online. I'll keep you posted! This is a demo from a private class today, another scene from my Nisqually Wildlife Refuge reference photos. 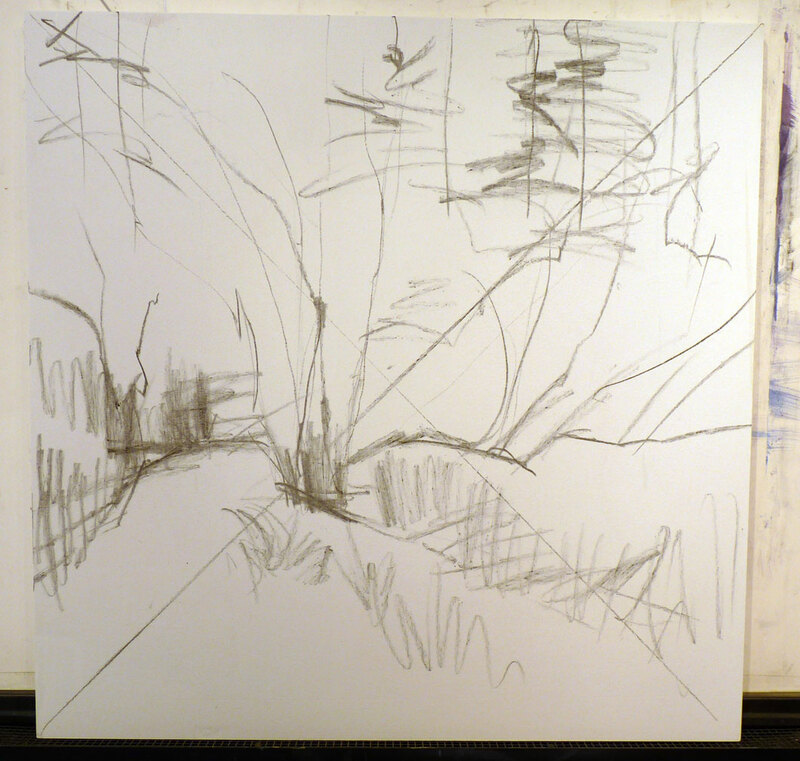 Working with 3 values and keeping it simple with a black acrylic underpainting.